It’s rare that we’re left completely in love with an entire collection during the NYFW the Shows. We find that we normally love a few looks here and there but never a show’s entire collection. That was changed today with the Taoray Wang Fall-Winter 2019 collection. We not only loved every single look, but we also loved every single item that made its way down the runway. When you see this incredible collection, you’ll understand. If there is a women’s suiting heaven, it would begin with the looks from the Taoray Wang Fall-Winter 2019 collection. Little did we know how much of a fashion feast we were in for; a variety of very chic and fashionable suits that sated our appetites. Herald by fashion designer Wang Tao, one of China’s most celebrated and accomplished designers and appropriately hailed as “the Queen of the Suit”, it’s not really a surprise that every look was amazing. Rare you will find every single look at a fashion show completely wearable but this was the case with the Taoray Wang Fall-Winter 2019 collection. The collection, called “Eternity, is a celebration of “Eternal Beauty” from the women who inspire Wang Tao. It boasted and highlighted Wang Tao’s fine tailoring, chic silhouettes, and exceptional textiles. She showcased suits to fit every style personality and multiple eras. 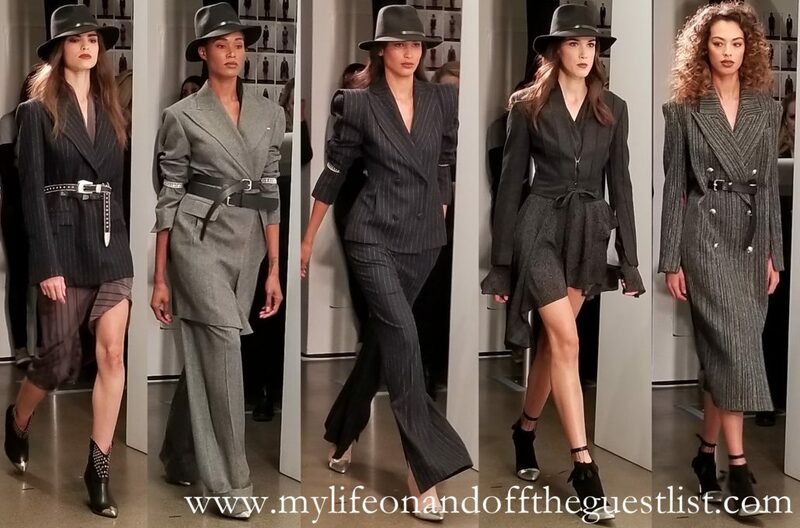 It’s quite difficult to choose a favorite but we audibly swooned at the 1940’s inspired gangster pantsuits. We were ready to welcome back the prohibition era and the effortless style of Lauren Bacall. Did we mention her ode to the old wild west? The chic doesn’t do enough justice to describe this spectacular collection. Find out more about her inspiration from the designer herself. We can honestly say this is one of our favorites (if not the favorite – we still have a few more shows to see) from this season. 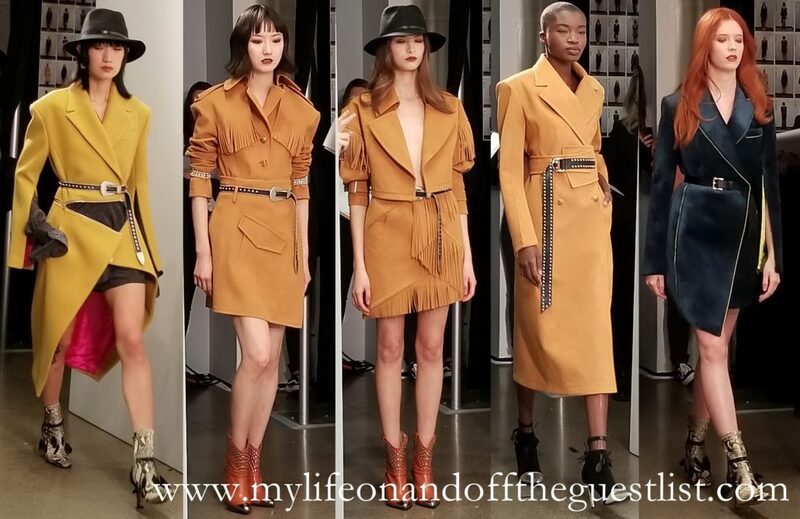 We look forward to seeing much more from Wang Tao and the Taoray Wang brand. What are your thoughts on this collection? Any favorite looks? Once again the City of Light was once again shining as legions of exquisite fashions captured the attention of the world. It is Haute Couture Fashion Week in Paris. We begin our enchantment with the stunning Armine Ohanyan Fall-Winter 2018-2019 collection. A couture collection made in France, entirely handmade, and intimately inspired by nature, showing the natural elements in all their forms. Ice, crystallization, rain, wind, dew, and roots are the elements and inspiration that beget this entrancing haute couture fashion week collection. Each shape of this women’s fashion collection represents one of these elements. At the same time a climate evolution where each season brings its unique beauty and a gentle and mysterious atmosphere. For us, this stunning Haute Couture Fashion Week collection evoked the many elements that describe women in general – beautiful, fluid, bold, and surprising. We were immediately drawn to the vibrant colors, multilayered textures, and arresting aesthetic. Everything seems to be in constant movement – never stagnant. Again, a perfect description of being a woman. 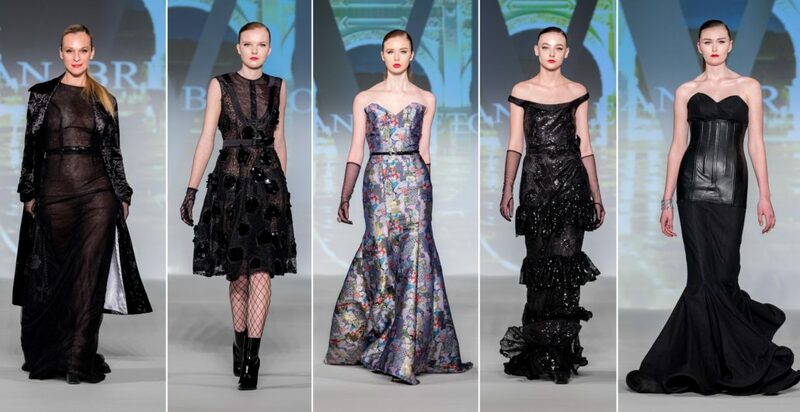 Armine Ohanyan’s amazing work is new to us but we look forward to seeing more from this head-turning haute couture designer. Her collection took our breath away. Are you following the Paris Haute Couture Fashion Week shows? 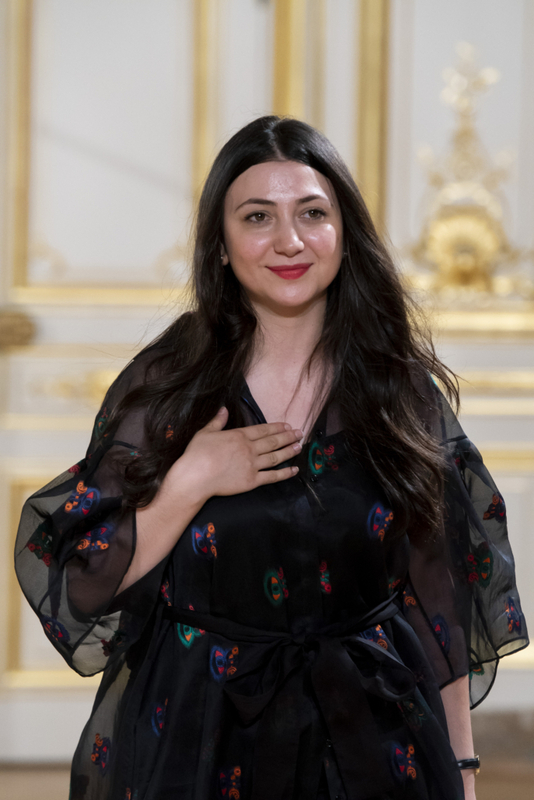 What are your thoughts on the Armine Ohanyan Fall-Winter 2018-2019 collection? With this Romeo Hunte New York Fall Winter 2018 Womenswear collection, we see a revised and an amped array of his existing signature outerwear styles being reinvented with bold details. Created for the powerful woman on the go, this collection features classic outerwear with transformable details and exquisite furs trimmings; shawls fashioned with textured materials, raincoats that are reversible and trimmed with fox fur, and sleek styles inspired by the combination of Aspen chic and luxe streetwear. This made for a stunning collection loaded with modern classic shapes that are luxurious, transitional and complimentary to any pieces in your closet. We personally love any outerwear that has a dramatic flair, so of course, we adore almost all of the pieces from the collection. 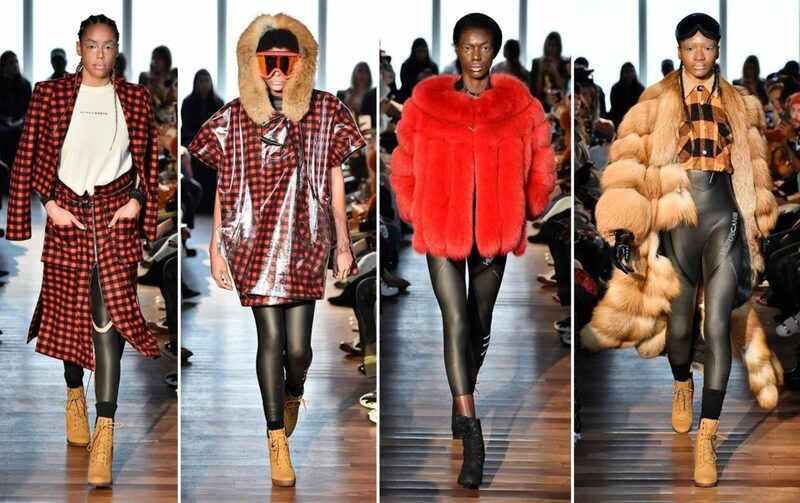 We want all the shearlings, that stunningly vivid yellow fur jacket, the super chic camel trench coast with fur poms, the transparent PVC and fur jacket, and the beguiling camel fur with a detachable bottom (swoon). Romeo Hunte New York is a definitive luxury women’s streetwear brand. It’s a perfect balance of feminine and masculine silhouettes with intricate and surprising design details. 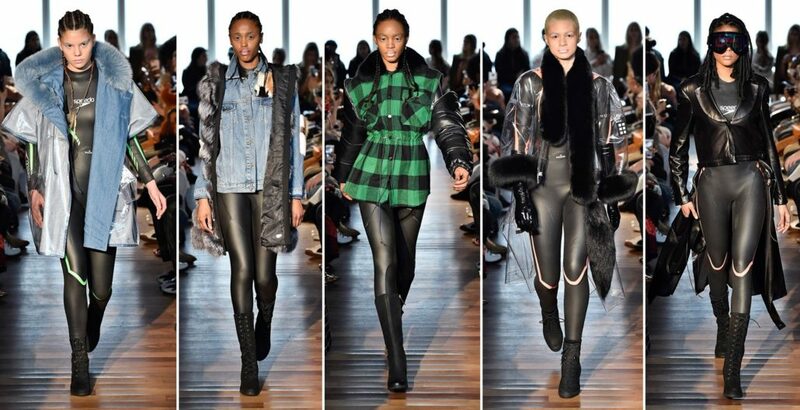 We can’t wait to see more from this powerful and impeccable luxury outerwear brand. Popular pieces from the line include their signature buffalo check shawl, which is transformed in PVC and wool materials, is representative of the core elements of the Romeo Hunte brand. 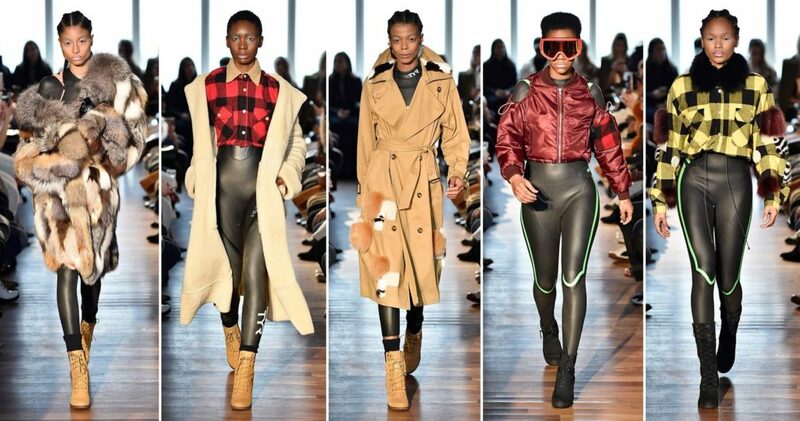 What are your thoughts on the looks from the Romeo Hunte New York Fall Winter 2018 Womenswear collection? Any favorite coats you’d love to see in your closet? Every look of the has an element of excitement, even the subtler looks. This season, the Malan Breton Fall Winter 2018 womenswear collection is inspired by the destruction of old status quo and the new beginnings that follow. 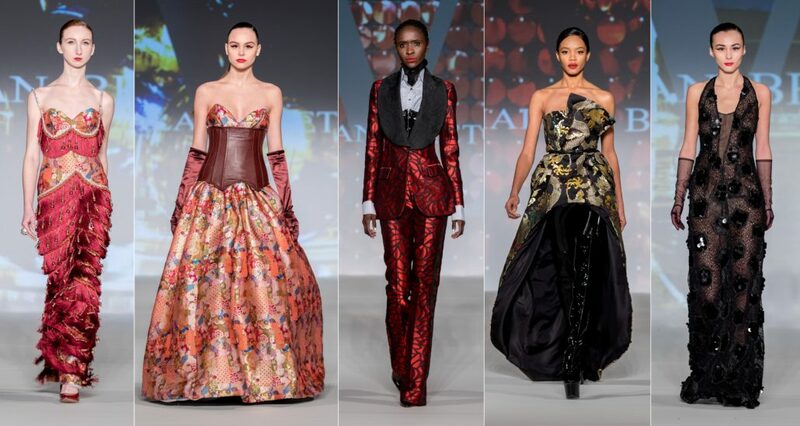 Aptly named “Alpha” – the first, the beginning, Malan Breton envisioned his fall-winter 2018 collection as a new hope, new beginnings, and rebirth. This inspiration is especially succinct as we are in celebration of the lunar new year, the year of the dog. Despite the dark hues of the collection, the Malan Breton Fall Winter 2018 womenswear collection is presented as a collection of ethereal light. This seasons collection was highlighted with a multimedia, art film which was presented during the fashion show. 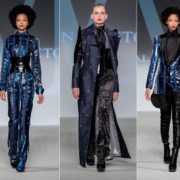 The Malan Breton Fall Winter 2018 womenswear collection featured powerful details, soft silk chiffons, embroidered silks, cashmere, wool, and tweeds, drawing strong inspiration from turn of the century British tailoring, Taiwanese construction, and silhouettes that are bold, and colorful. The color palette featured mostly black, with a mix of red, coral, various metallics, and navy. Finding favorite pieces in the Malan Breton Fall Winter 2018 womenswear collection is not a difficult task. The first five looks displayed above quickly won us over with it’s sharply tailored pieces (that hint of sparkle you see in what looks like stars in the night sky are metallic embroidered clusters). We love the high point shoulder details, the bold use of sequins, and color (the man does a great red garment) in this collection. For a talent known for his signature detailing, ethereal gowns, and simple shift dresses in incomparable fabrics, we couldn’t imagine anything less than the spectacular display Malan Breton presented for his fall-winter collection. 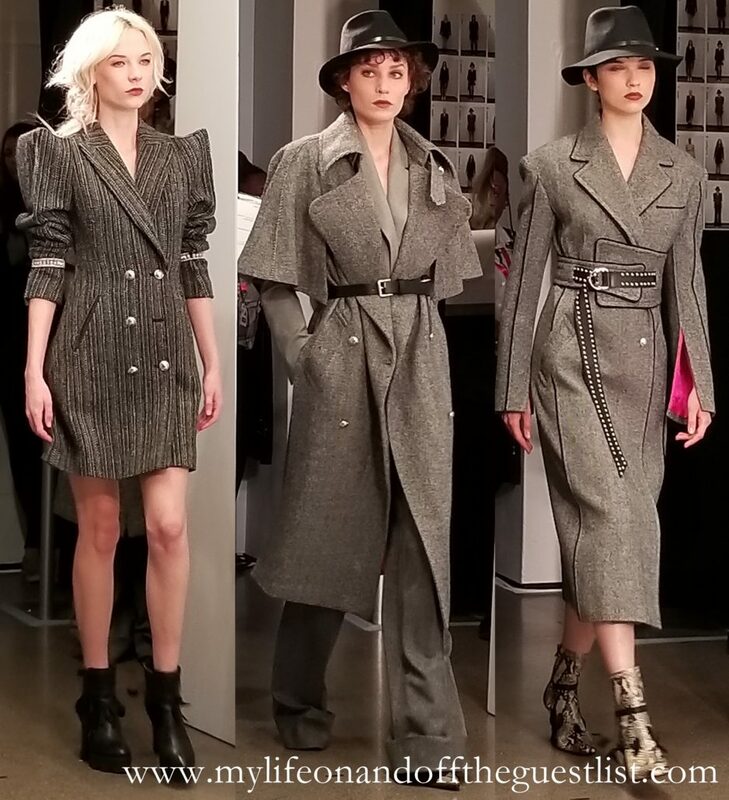 Would love to hear your thoughts on the Malan Breton Fall Winter 2018 womenswear collection. Have an opinion? Share it in the comments. It’s no surprise that women who crave sophistication, comfort, and glamour flock to the fashion collections of Pamella Roland. Mrs. Roland has continuously been a go-to for elegant, modern womenswear. Her Fall Winter 2018 Womenswear collection is no different. For this NYFW season, the Pamella Roland Fall Winter 2018 Womenswear collection is inspired by the royal jewels, history, and architecture of one of the most beautiful cities in the world, Prague. Prague boasts spellbinding architectural gems from the Gothic, Renaissance and Baroque era, all of which remain intact. Through embroidery, Pamella Roland incorporates ornate metallic threadwork, sequins, crystal appliques, pearls, and a variety of feathers into luxe cashmere, fil coupes, and jacquards to translate baroque-era motifs and represent the royal Prague interior in fabric form. The main focus of the Pamella Roland Fall Winter 2018 Womenswear collection color palette is jewel tones in ruby, amethyst, sapphire, and emerald. Highlighting these deep, rich tones are metallic gold and gunmetal elements to create an authentic experience of the extraordinary and precious masterpieces that are the Bohemian crown jewels. The Pamella Roland Fall Winter 2018 Womenswear collection also incorporates Pamella Roland’s signature sleek looks (with a bit more extravagance), dramatic feminine silhouettes using tulle, and creatic fabric manipulation. Some of our favorite looks from the Pamella Roland Fall Winter 2018 Womenswear collection include the sapphire and silver baroque motif cloqué off-the-shoulder top and pant, the emerald stretch crepe cocktail dress with pearl embroidered bodice and fringe hem, the black floor length lurex cape coat over black stretch-crepe strapless bustier jumpsuit with oversized crystal embroidery, the black lurex crepe coat with silver, ruby, and amethyst ombre sequin cocktail dress, the very striking hematite metallic embroidered baroque motif fringe gown (easily our ultimate favorite), the amethyst ombre sequin and ostrich feather kimono caped gown (our second favorite piece), and the gold threadwork embroidered gown with flounce tiered baroque motif cloqué skirt. 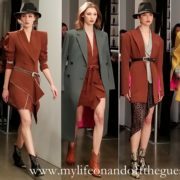 As we stated at the beginning, women who crave sophistication, comfort, and glamour flock to Pamella Roland, and her fall-winter 2018 womenswear collection clearly shows why. What are your thoughts on the Pamella Roland Fall Winter 2018 womenswear collection? If your eyes haven’t had the pleasure of seeing the incredible onslaught of visual fashion candy, it is Paris Haute Couture Fashion Week! Stunning Spring/Summer 2018 collections, varying from understated to the theatrical, are gliding down the Paris runways as we speak. Today we’re highlighting one such fabulous show. This Paris Haute Couture Fashion Week show highlight, the Maria Aristidou SS2018 Collection, welcomes you to the Secret Gardens of Alexander. 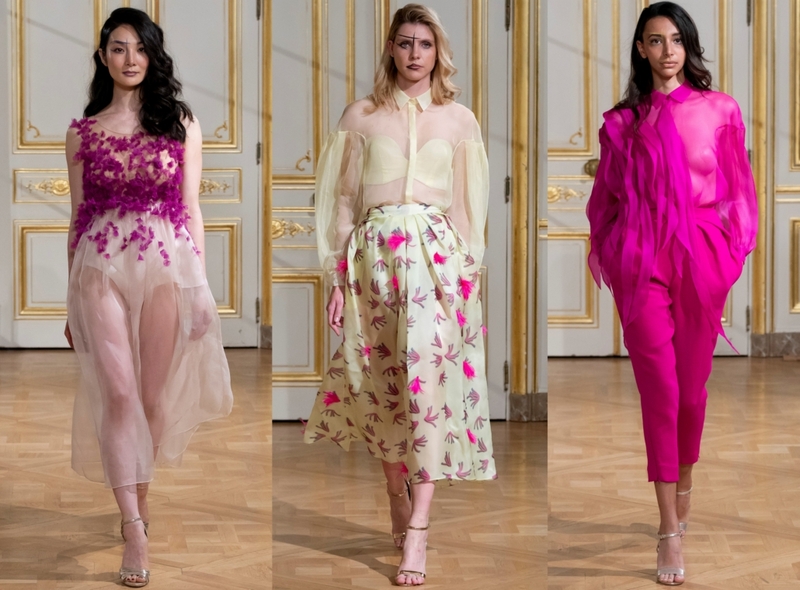 For her Paris Haute Couture Fashion Week show, Maria Aristidou, a specialist in couture knitwear, created a fantasy colorful world for spring-summer daywear-eveningwear for women that romance, positive energy, and freedom are the safety keys to happiness. A playground of flower patterns with silk viscose and metallic yarns where elaborate embroideries decorate the luxurious knit fabrics creations for the women today. Her SS2018 Haute Couture collection boasts carefree curves and sleek cuts with unexpected details, and accessories that complete the beauty of this womenswear secret garden story. Maria Aristidou’s collection gets you ready for utopia, a fantasy land that euphoria is the only feeling of existence! A land with never-ending gardens of delicate Japanese flowers, that the human eye cannot grasp in one look!!! A land with human smiles that never will be forgotten and always watching over us. One of them, close to my heart is Alexander Boulais! My agent in Paris! The person that with his instinct believed in my work. A gentle human soul, a nobleman that was always calm, soft-spoken with a genuine smile and loved his garden! May you be the wind and the light that crosses your Secret Gardens and always be a shining star upon us! What are your thoughts on Maria Aristidou‘s Paris Haute Couture Fashion Week show? What’s your favorite thing about haute couture? Share your thoughts in our comment section below. When it comes to glittering formal wear that is always feminine, fashion-forward, and all around fabulous, the go-to designer is Sherri Hill. Whether you’re hitting the red carpet, the prom, or any formal occasion, this formal evening wear designer should be at the top of your list. During New York Fashion Week, the stunning Sherri Hill Spring-Summer 2018 collection of occasion dresses debuted to a packed house of editors, celebrities (both on and off the runway), and influencers. The Sherri Hill Spring-Summer 2018 Collection started with the bold shade of red. Red exploded down the runway in satin, intricate beadwork, large florals, and fringe. Speaking of fringe, the ornamental detail dominated the collection, appearing in crop tops, long and short skirts, and gowns. Luxe fabrics, lots of sparkles, more intricate beading, and a variety of figure-flattering silhouettes, including pants and jumpsuits, were highlighted in the popular color palette of whites, pinks, and shimmery pastels were also present throughout the collection. While all the looks were stunning, one truly stood out to us. Our favorite look from the evening was a stunning spaghetti strap “unicorn” gown with a very dramatic slit and pastel beaded bodice. The highlight of the Sherri Hill Spring-Summer 2018 Collection was the presence of Actors Jamie Foxx and Keenan Wayans sitting front row. 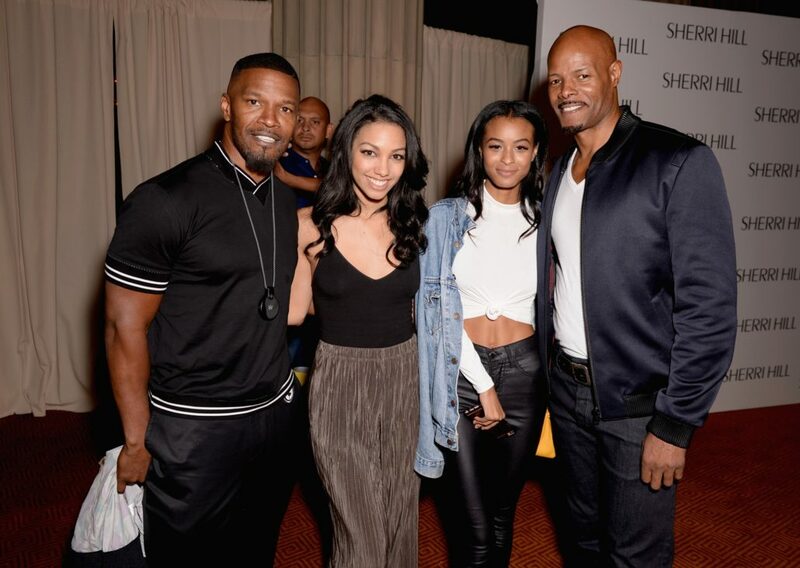 Both men were there to support their daughters, Corinne Foxx and Nala Wayans, as they made their NYFW runway debut. You may not know this, but both Kendall Jenner and Hailey Baldwin made their New York Fashion Week debuts in Sherri Hill fashion week shows. The Sherri Hill collection epitomizes the fashionable lifestyle of today’s contemporary women. Each look is designed to enhance and fit the female form with fashion-forward styling and wearability. Her design career began to gain recognition when various Miss USA, Miss Universe, and Miss America contestants won titles in her gowns. Today, the Hill family business has a network of over 1,000 stores selling the brand in over 30 countries. What are your favorite looks from the Sherri Hill Spring-Summer 2018 Collection? For the past 10 years, Nolcha Shows has been giving upcoming and indie designers a chance to shine during NYFW. To celebrate their 10th Anniversary and the Spring/Summer 2018 season, Nolcha Shows featured seven collections, one of which was the Luyang by Yanglu Spring 2018 Collection. 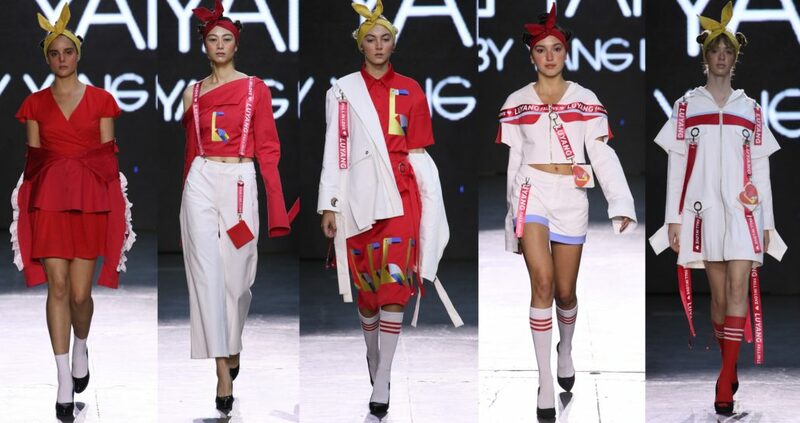 Based in Chongqing, China, Lu Yang graduated from Sichuan Fine Art Institute with the master’s degree in Fashion Design and made his debut his Lu Yang collection in 2013. His inspiration for his Spring 2018 Collection? The act of falling in love. The color red playing a prominent role in many of the designs. The designer uses “Love” as the theme to express the emotional feelings of deep and passionate love. A flamingo is often referred as a metaphor of loyalty and faithfulness when comes to love. The collection featured intricate folds, embroidery, printing, and hanging ribbons, all to emphasize love in its many forms. Colors such as red, white and blue and the geometric patterns derived from the shape of the Flamingo have been incorporated and elaborated in the Luyang by Yanglu Spring 2018 Collection. The collection featured a mix and balance of function and minimalist aesthetic. Waves of folds, embroidery, printing, hanging ribbon and other techniques used in the design state love in a variety of forms and express vigorous vitality. The collection appeals to modern city girls and encourages feelings of love at first sight. It celebrates how love can make your heart flip; how it can create the feeling of butterflies in the stomach; how it can make your mind go crazy. Love can make you passionate, innocent and pure, it can bring out the best in you. The Luyang by Yanglu Spring 2018 Collection encourages you to understand, to experience, and to love. What are your thoughts on the Luyang by Yanglu Spring 2018 Collection? Does his collection make you think of love? Any favorite looks from the collection?